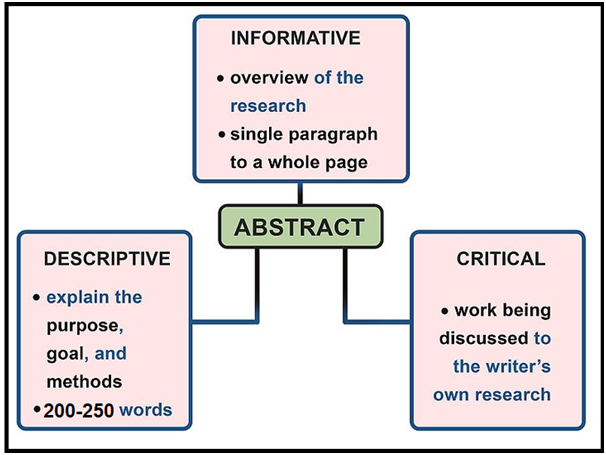 An Abstract is a part of an academic paper (including dissertation)which, even though placed at the top, is written only after completing the document. It is a condensed form of the vital information, its analysis, limitations, and recommendation presented in the dissertation. The abstract is the mirror of all the hard work put into the dissertation. It is the readers’ first encounter with your academic paper, which can compel him/her to read further. A well-written abstract tends to impress the reader and increase the readership of your dissertation. Writing abstract of a dissertation is more difficult as compared to other academic paper due the elaborate structure of dissertations. The complex structure of dissertation tends to complicate the summarisation process, thereby forcing students to go for some guidance regarding their respective dissertation abstract contents. Here in this write-up, our dissertation abstract writing experts have provided useful techniques and a dissertation abstract example, to answer all your queries regarding an abstract, thereby facilitating your task of dissertation abstract writing. After the culmination of their extensive research, students can often find it very frustrating when unable to write a proper abstract. Here is the list of what should be included. Every academic paper deals with some kind of problem or issue, which is discussed throughout the length of the paper. Therefore, the first question in the mind of a reader (including a professor/academician) is – Why do we care about the problem and the results? To address this question, the problem needs to be presented in an interesting manner enticing its readers.For this, the best line of approach is to provide a motivation for taking up this issue. You can understand it better by having a look at our dissertation abstract sample that is available on our website My Assignment Services. Not many students can understand the purpose of this section, therefore, the pdf sample can guide them through. Every dissertation is trying to solve an issue by making incremental progress that is usually acknowledged as important. Hence, the scope of your work (a generalised approach, or for a specific situation) must be presented in a succinct manner, without getting into the technicalities. It must also include the importance of your work, its complexities, and its impact, if successful. To get more insight into the formation of a problem statement, you can always see our example of dissertation abstract in the research paper, which is prepared our dissertation experts. Here, the approach is mentioned in general (prototype construction, analytic models, or analysis of field data for an actual product) without explaining the methodology intricacies. Purpose of abstract is to make it lucid for even a freshman, hence deliberate effort should be made towards achieving it successfully. One important aspect that also needs to be mentioned is the variables which you controlled, ignored, or measured during the research. Numerous dissertation abstract sample pdf, available on our website, can further help in dissertation abstract writing with the correct approach. This part of the dissertation abstract must be objective. The use of vague term like “very”, “small”, or “significant.” must be avoided as the results are not clear, the significance of the research is diluted. The clear-cut argument in the form of result is the key to getting more readers. This section of the dissertation abstract briefly specifies impact of the results (if it’s going to change the world) along with some future recommendations. This exhibits the larger worldview of the researcher, which is (should always be) concerned with the society, we live in. Getting detailed information about each of the sections has obviously made you more informed than earlier. So, now the google searches of “How do you write an abstract?” would be stopped and the real writing can begin. Dissertation Abstract is an original work and not an excerpt from the academic paper. It must be fully self-supporting and make sense by itself, without additional reference to external sources. It is a well-developed into a single paragraph of approximately 250 words in length. 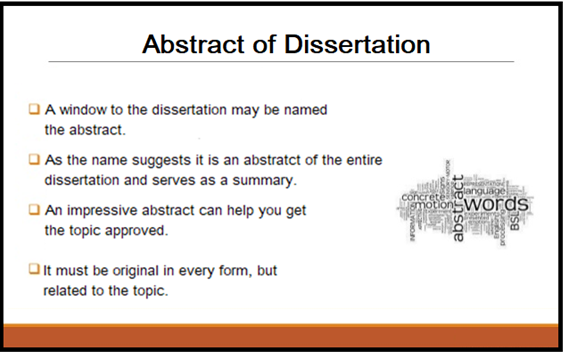 The dissertation abstract structure is indented and single-spaced maintaining appropriate referencing guidelines like APA, Harvard etc. Such minor details (including the dissertation abstract length) are not easily available in study material; hence, the students can get confused with the guidelines. This is why it is advisable to seek dissertation abstract writing help from specialists. Here is a dissertation abstract sample pdf that can clear all your doubts regarding dissertation abstract writing. How Can We Help You with Dissertation Abstracts? Our subject matter specialists have years of experience in writing thesis and dissertations for university students across the globe. As we know, abstracts being a part of academic papers as to be written by the same person, in this case by our experts. Therefore, the knowledge and expertise possessed by them can easily bring out the best dissertation abstracts. Further, the dissertation abstract example available on our website can reaffirm our claims. The most important aspect of any academic paper, its quality, is usually not easily achievable by everyone. However, our experts are well adept in all the best practices to make your dissertations, as well as its abstracts, flawless with excellent quality. Plagiarism is also a cause of concern in the abstract for a research paper like a dissertation, hence, using advanced tools to detect copied content is essential. Meeting deadlines and affordability of services are also important USPs of our dissertation writing services. So, call us +44-7561019509 or email us help@myassignmentservices.co.uk for all kinds of help in your abstract writing. We are available 24/7 to assist you.